Galion Inquirer file photo Visitors to this weekend’s Oktoberfest in downtown Galion will enjoy music, music and more music. Three stages will showcases different kinds of music from Thursday through Saturday evening. There will also be an art show, carnival rides and lots of food to sample. GALION — It’s here. This week brings another Oktoberfest, the 41st one, according to event organizer Kent Gimbel. 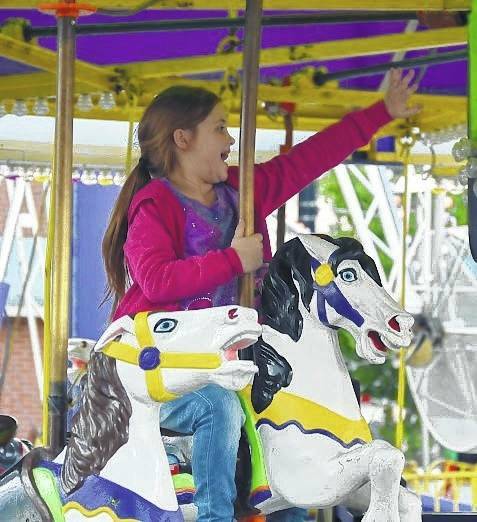 Starting Thursday, Sept. 28, and running through Saturday evening, Sept. 30, Galion’s downtown area will be filled with vendors, food trailers, carnival rides, a lot of visitors and city residents — and plenty of good music. The music has always been a big draw for Galion’s most popular fall event. This year is no different as three stages set up in different parts of the downtown area will entertain. The evenings will be filled with the sounds of kids screaming with delight on rides, music and the aroma of sausages and more grilling in the out-of-doors. Thursday’s entertainment includes: On the Main Stage, the Semer Brothers Band, out of Willard. On Stage 2 will be the Road Less Traveled band. The third stage, dubbed the Christian Gospel Stage, will get going about 6 p.m. with Jane Horton, John Slaback, Jamie Smith, Lynda Wenzel, Tina Young and Dave & Ethel Smith performing for 30 minutes each, through 9 p.m.
Friday’s entertainment will include Xero at 6:30 on the Main Stage and local rocker/country singer Jessica Hannan at 8:30.Hannan and her band are from the Ashland area and have been singing locally and across the country for more than 15 years. On Stage 2 will be Boot Leg City playing at 7 p.m. and on the Christian Gospel Stage there will be five performances, running from 5-10 p.m.. The music starts with Laura Hoffman, followed each hour by one band yet to be announced, the Bucyrus Nazarene Praise Team, REACH Worship and ‘In His Name,” at 9 p.m.
On Saturday the music gets going much earlier as the downtown streets will fill up early with eaters and listeners and riders and visitors. On the main stage will be Standard Time at 1 p.m.; Brian Smith and the John Vermeulen Octet at 3 p.m.; the always-popular (and local) Erik Gimbel Orchestra at 5 p.m.; and Alter Ego at 8:30 p.m. On Stage 2 will be Madison Shilliday at 7 p.m., Brady Jacquin at 8 p.m. and Chase Beaire at 9 p.m. There also will be at least one art show in the downtown area. https://www.morrowcountysentinel.com/wp-content/uploads/sites/29/2017/09/web1_Oktobefest-13.jpgGalion Inquirer file photo Visitors to this weekend’s Oktoberfest in downtown Galion will enjoy music, music and more music. Three stages will showcases different kinds of music from Thursday through Saturday evening. There will also be an art show, carnival rides and lots of food to sample.